Even if you are using a proxy, websites can still access your real IP address via WebRTC (Web Real Time Communication) leaks. WebRTC is used for voice, video, or file sharing over the Internet. But if you're looking to hide your location you'll want to disable WebRTC because it can reveal your real IP address. 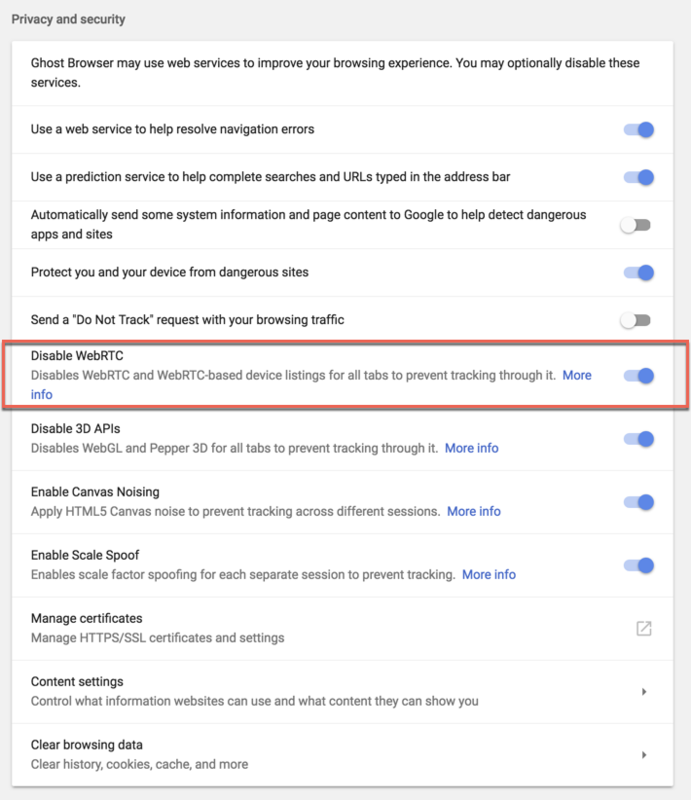 You can turn off WebRTC in the privacy section of the Ghost Browser settings by following the below instructions. If you still think your IP address is leaking after turning off WebRTC, please contact us and let us know how you tested it so we can replicate the issue. Be aware that some websites (like whoer.net) will tell you that your IP address is leaking and that WebRTC is still enabled even when it isn’t. If they say that WebRTC is leaking your real IP, but display a null result for your actual IP address, that means that you are not leaking your real IP address - success! "But Some Sites are Still Showing WebRTC as Enabled!" The short of the long is that sites like whoer.net think Ghost Browser is Chrome since Ghost is also built on Chromium. It's not possible to disable WebRTC in Chrome and because whoer.net thinks you're using Chrome it shows WebRTC is still enabled. In upper right corner of the browser click the browser menu (3 dots) and select Settings. Click Advanced to reveal the advanced settings. As seen in the screenshot below in the Disable WebRTC section, toggle the switch to the ON position. Like the other browser settings, toggling this switch will persist even if you quit the browser. So rest assured that if you disable WebRTC it will remain disabled until you re-enable it. Please note that WebRTC settings apply only to the profile in which they are set. So you can have one profile with WebRTC enabled and one with it disabled, for example, if you want.